On Mars as in the USA, vehicles are getting larger with time. You can see why: payload is tough to get into orbit, and expensive. I don't actually know what the postage for, say, the Mars Rovers' communications devices, but I bet it's larger than the total annual revenue of the postal services of a small country. The first Mars rover, the 1997 Sojourner, was barely larger than a skateboard. The ones in the next mission in 2004, Spirit and Opportunity, were about the size of a bicycle, albeit one with six wheels and solar-panel wings. And Curiosity, which landed on Mars in 2012, is the size of a car, crammed with cool instrumentation for exploring the Martian surface. The next one will be the size of a large SUV - electric, of course. 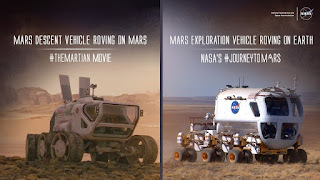 There's a great side-by-side comparison of how things happen in the movie The Martian and how NASA's engineers are designing things for the #JourneyToMars project; one of them shows an exploration vehicle designed to house and move two people. They say it's the size of a pickup truck, but I say it looks more like the iconic VW minibus that moved so many happy campers. But the movie is set way in the future: Matt Damon plays Mark Watney, the one who gets stranded and has to find a way to survive and to work his way home, armed with a good set of skills (he's the missions's mechanical engineer as well as the botanist) and a good sense of humour. If you haven't read the book, yet, I highly recommend it: there's a lot that didn't make it into the movie, and the book is way funnier. 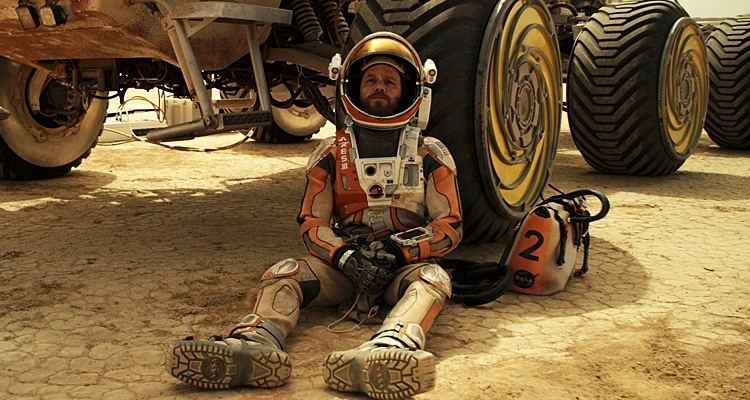 I can't remember if author Andy Weir specified how large that rover was, but I was surprised to see it depicted in the movie as something quite a bit larger than an SUV. I mean, the wheels alone are four feet across.The rover is not as large as the monstrous tar sands trucks, but it's still twice as big as a VW camper van. I couldn't help thinking, I hope he's got some spare parts for that journey, over rough terrain, to the site of the craft that's going to take him off the surface of Mars, and home, to Earth. Also: I'd hate to have to change the tires on that baby. And there's another thing about that movie. Maybe it's me with my obsession with climate change. Maybe it's that it's Matt Damon with *his* climate change obsession. (Remember, this is the actor of Gasland, and one of the reporters on Years of Living Dangerously, and the big name on water.org.) But next time you watch The Martian, pay attention to the speech in the very last scene - the speech that's not in the book! It goes something like this (and I paraphrase liberally): "When you're out there in space, chances are you will get into a life threatening situation where you think, This is it, this is the end. You can accept that - or you can start to do something about it. You can science the heck out of it, and start solving one problem, and then the next, and then the next. Because that's what's going to get you out of there, and back home to earth, alive." Sounds to me like a message to a sentient species. One that's lost its way, whose situation seems hopeless, and that needs to find a way back to the earth that was once its home. 1. Why are cars so small outside the US?